After decades of rapid economic growth and per capita income gains, Brazil is struggling. According to the International Monetary Fund, the country’s GDP is poised to contract by more than 7% in 2015-2016. No single factor explains this reversal of fortune. Four do. For starters, there is the structural trend of rising primary government expenditure as a share of GDP, which reached 36% in 2014, up from 22% in 1991. This increase reflected a political desire to address the poverty and inequality that had gone unaddressed during previous decades. To support the increase, Brazil’s government increased taxes on consumption and promoted progress toward labor-market formalization. Nonetheless, public investment, particularly in infrastructure, took a hit. In fact, with the exception of the 2005-2008 period, total investment as a share of GDP has remained below 20% since 1991. The second factor shaping Brazil’s fortunes is the commodity-price super cycle. The upswing in commodity prices that began in 2004 brought many benefits for Brazil: external surpluses, the accumulation of foreign-exchange reserves, positive wealth effects, and higher investment in natural-resource-related sectors. Add to that exchange-rate appreciation and rising minimum-wage floors – not to mention public-sector disbursements indexed to the latter – and Brazil enjoyed a virtuous domestic cycle featuring positive feedback loops between demand for services and formal employment. The problem is that Brazil allowed high commodity prices simply to reinforce the underlying growth model, instead of preparing its economy for the inevitable bust. Profitability levels in the manufacturing industry were crushed by exchange-rate appreciation and rising domestic production costs, and levels of production practically stagnated from 2008, before starting to decline in 2014. When world metal prices began to fall in 2011, followed by food prices in 2014, Brazil’s economy lost its growth engines. To be sure, Brazil’s government did make adjustments to its growth pattern following the global financial shocks of 2008-2009. But it took a shortcut, relying on counter-cyclical fiscal and monetary policies to boost growth. This is the third key factor contributing to Brazil’s current travails. While the first, justified round of expansionary policies caused GDP to increase by more than 7% in 2010, growth quickly returned to lower levels. The government was then compelled to implement another round of stimulus policies in 2012-2014, which included a sizable package of tax exemptions, local-content requirements, and credit expansion via transfers of public debt to state-owned banks. In an attempt to curb inflation without hiking interest rates, the government also held down regulated prices. Given structural factors, however, the main outcome of this second round of stimulus was fiscal deterioration. 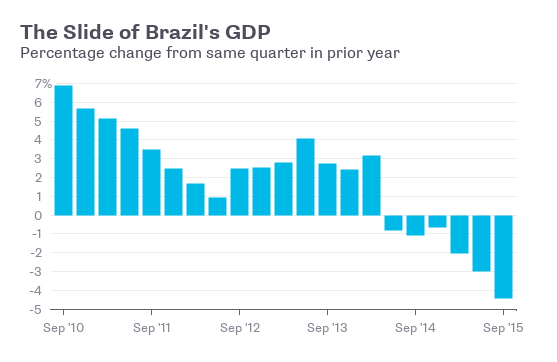 Over the last year, Brazil has been struggling to unwind that attempted shortcut. The realignment of regulated prices with market prices, together with that of foreign and domestic prices (through exchange-rate depreciation), produced an inflation shock, with the consumer-price index reaching a 13-year high last year. In order to contain the shock and control inflation expectations, Brazil’s central bank was driven to increase interest rates. Meanwhile, the government began to pursue ambitious fiscal-adjustment targets, with the goal of creating space to shift policy attention toward structural impediments to growth. The fourth factor undermining Brazil’s economic performance arose unexpectedly last year, when a multibillion-dollar corruption scandal engulfed the state-controlled oil company Petrobras, prompting a far-reaching investigation of high-level politicians and triggering a collapse of private investment. Large domestic private groups affected by the scandal have faced financial drought, operational disarray, and a sudden halt in demand, while outside investors, driven by a combination of shaken confidence and opportunism, adopted a “wait-and-see” approach. An ensuing political crisis has reinforced the investment paralysis – and has also hindered approval of the fiscal adjustment measures. The medium-term silver lining is that the Petrobras investigation demonstrates Brazil’s commitment to the rule of law, implying that the country’s reputation among investors will recover. This will help to strengthen private-sector competition and cause public spending to become more effective. In the short term, however, Brazil can expect the ongoing investigation to continue to undermine GDP growth, and thus diminish tax revenues, further impeding efforts at fiscal consolidation. In an effort to minimize the budget deficit, the authorities have proposed new tax measures, including new rules on capital gains and the reenactment of a tax on financial transactions. Given the current dependence of taxation on consumption and the ongoing current-account adjustment, the tax on financial transactions, in particular, will be vital to buy time for mandatory public expenditures to be reviewed. Among the expenditures that will come up for review are pensions, as social security expenditure probably reached close to 8% of GDP last year. Efforts to make the labor market more flexible and reduce the cost of tax compliance will also help to improve Brazil’s investment climate. To recapture strong and reliable growth, however, the key will be improved confidence – and that hinges largely on the government’s capacity to overcome the current political crisis. If it fails, Brazil’s current economic rough patch could well turn into a swamp.